Do you worry about your guitar or bass cables failing at a critical moment during your performing or recording? Your music is your creation and deserves the best. In a moment of inspiration, you could play a piece of musical history that goes down as one of the classic licks of all time. However, a great performance in the studio or stage could end up unheard without good instrument cables. Cable buzz, audio dropouts and other problems are all too common with inferior quality guitar cables. JiGMO cables are created by musicians and music producers like you, so we understand why the right instrument cable is so important for your performance; we understand the stress that your cables are subjected to, and that is why we designed it that way - based on our own needs. So what are you waiting for? Are you ready to stop worrying about your cables and concentrate on creating a piece of musical history with your talent? Go ahead and click Add to Cart now and take charge of your performances! CABLES THAT LAST REALLY LONG: Strong, reliable cables no matter where you need it - live gigs or in the studio. Our 6m (20 ft) guitar cables come with heavy-duty ¼ - ¼ straight-rectangular non-reactive corrosion-resistant gold-plated metal jack plugs, and they have an extra strong PVC jacket with internal strain release clamps. In addition to that, they have a metal spring on the outside to provide extra reinforcement and tensile support to cope with the extra rigors of the performing musician. GET MAXIMUM SIGNAL STRENGTH: Our Oxygen-Free Copper (O.F.C) cables give you the highest power and conductivity for your signals, so your guitar amp cable gets the optimum clarity and connectivity it deserves. SAY GOODBYE TO 'CRACKLING' SOUNDS, PREVENT INTERFERENCE AND HANDLING NOISE: Together with our conductive PVC layer and the high density stranded copper serve shield in our cables, you get a strong barrier against EMF (electromagnetic interference) and radio frequencies from wireless devices like mobile phones or electric currents. 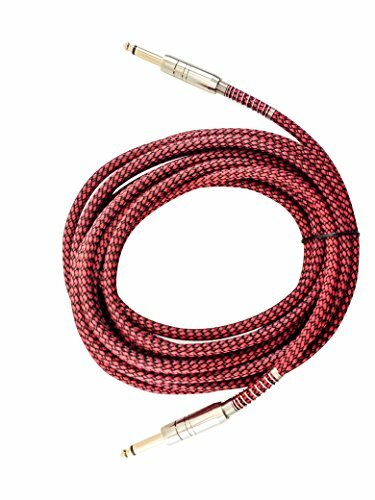 GET CLEAR HIGH AND LOW FREQUENCIES, FULL SPECTRUM AUDIO: Showcase your talent beautifully with this instrument cable for electric and bass guitar, with a true, faithful reproduction of the full spectrum of your playing - whether in the studio or on stage. Plug into guitar amplifier, effects processors, or DI boxes and get exactly the sound you want to hear. 1 YEAR 'BETTER SOUND' WARRANTY: Have a problem? No worries, simply get in touch and we'll be happy to replace your cable. Get total peace of mind and feel free now to focus on your music. If you have any questions about this product by JiGMO, contact us by completing and submitting the form below. If you are looking for a specif part number, please include it with your message. MXR 3PDCP06 Instrument Patch Cable, 6"